e-mailing Patricia_Gaetz@ georgetowncollege.edu. 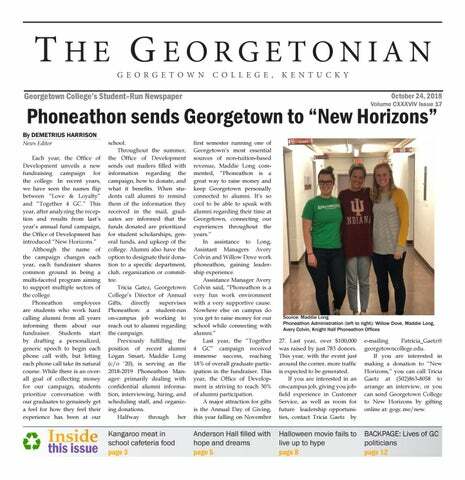 If you are interested in making a donation to “New Horizons,” you can call Tricia Gaetz at (502)863-8058 to arrange an interview, or you can send Georgetown College to New Horizons by gifting online at: gogc.me/new. leaner meat, is a healthy alternative and he thought it could possibly be beneficial for the students. He continued to validate his decision, saying the meat was completely safe and USDA certified, he had no inten- Source: shared.com tion of hurting Students in the Potter-Dix school district captured sharing a the children. meal together. purchased by the school district from dent. After several parent complaints, SYSCO, a food distributor that sup- the superintendent called on the prinplies meat to restaurants, schools, and cipal of the school to investigate the healthcare facilities. issue immediately. He backed up his Frei came clean about using the reasoning for using the meat being that kangaroo meat for lunch, smuggling it is healthier, and it is not illegal. He it into work, after being confronted by believes it is his duty to expose the chilthe school principal and superinten- dren to exotic meats. been reported as being fully compliant with the case. Hussain is willing to return to the U.S. as he is currently in Pakistan for business, any time he is needed during trial, and has said that his heart is broken for the victims and their families. He further mentioned that he will do anything to make the situation right. As a result of the incident, the limousine company has taken all of its vehicles off of the road at this time, halting business and three of its vehicles have already been seized by police pending investigation. from that championship year, Coach Meyer has lost to an underdog each year, knocking the Buckeyes out of Championship contention. The most notable losses though are out of the last two years. OSU lost to an Iowa team that was a joke 55–24 in 2017. Then this past weekend OSU lost to Purdue 49-20. Let’s not forget that Purdue lost to a bottom tier SEC team Missouri, on their home field. Missouri has lost big to Alabama and Georgia, not helping coach Meyers’ attempt to make it into the playoffs. As a coach, being upset by a team is bad, but being upset by the same team multiple years in a row is much worse. It speaks volumes on the lack of preparation that Meyer puts into some of these games. 6 p.m.	8 p.m.	6 p.m.	1:30 p.m.	2 p.m.	6 p.m.	7 p.m.	8:30 p.m.	5 p.m.	7 p.m.	7 p.m.	5 p.m.	7 p.m.
@	@	vs. vs. vs. @	vs. @	vs. vs. @	vs. vs. vs.
Hockey League (AHL). The AHL was by far the most developed of the hallway sports. At one point, there was even an appointed league commissioner and team sign– ups. Even the non–participating residents took initiative by picking a team to cheer for. Although that building isn’t known for its well mannered residents, there was a rather safe hallway hobby. Many dorms across the country have had their share of golf putts, but with the length of the halls in Anderson, it was known as one of the hardest holes in all of golf. Anderson Hall may get a bad reputation around campus, but when you put a bunch of wide–eyed freshman males living together in one building, usually only good things are bound to come from it. ers, they have a two–headed monster at Power Forward. With Derrick Favors and Jae Crowder, they can play small ball with Crowder and a more traditional game with Favors. The X-factor for this Utah team is that they can play defense and had one of the highest defensive ratings last year and are on their way to doing it again. The saying goes “defense wins championships,” but with the Golden State Mon– stars wreaking havoc on the NBA with five all–stars in their lineup, there is no reason that defense can’t win this team the three seed. Penn State lost playoff hopes early on after losing two games. The Badgers loss to University of Michigan brings a lot to what happens in the west division. For the second year in a row, Penn State lost to Ohio State and Michigan State in back–to–back weeks. Both years, playoff hopes were killed by the Spartans. The nightmares for the Big Ten continued this past weekend. Ohio State, ranked, number two in the country, was favorable, and people thought they were the only team that could compete with Alabama. Traveling to West Lafayette to face Purdue, Ohio State was hoping for an easy win. The Boilermakers had different plans as they “killed” the Buckeyes, beating them 49-20. Playoff nightmares are hovering over the Big Ten. Michigan has the best spot right now to get into the playoff as they are sitting on the top of the east division. The Wolverines are going to face two difficult opponets in the next couple weeks. Penn State will travel to Ann Arbor, and Michigan still faces the Buckeyes. Big Ten is such a tough conference for football, because you never know who is going to come out of nowhere and rip out the playoff hopes for your team. There are more tricks than treats in this conference. Teams can bring out the worst of fans and nightmares are always looming. Will the scares of October still haunt the Big Ten in the months to come? in this study and try and benefit its students in any way possible.” Dr. Eddy also was very encouraging of the education students to get involved saying, “I think anyone interested in getting research experience would benefit from being involved. I also think anyone interested in studying the how and why behind learning would benefit.” Since this is an on-going study, they are always looking for more volunteers. If you are interested in psychology or education this is the perfect position for you. Contact Dr. Singer to find out more information about ways to get involved. Amazon, Google Books and goodreads.com. Wedemeyer plans to continue her writing career as a hobby, and she is even working on her next novel. This one is about a group of friends in college who must fend off beasts who personify emotions such as depression and anxiety using their Dungeons and Dragons like abilities. If you would like to support this creative leader on campus, you can find Wedemeyer’s book on Amazon and Barnes and Nobel, and you can even find copies in the bookstore. Another way to support would be to attend the 2018 Kentucky Book Festival. It is being hosted this year at the Kentucky Horse Park which is conv e n i e n t l y Source: Erin Wedemeyer located 15min- Pictured: The cover art for novel “A Vow To utes away from Fury” campus. 9a.m.-4p.m.. Feel free to come There will be authors out and support Kentucky litfrom all across the state there erature and one of our own to present their works from Georgetown Tigers! kind of community do you want to live in? 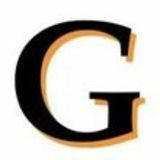 How are you intentionally supporting that as a positive member of that community?” Dr. Sandberg comes to Georgetown College equipped to achieve these goals with 25 years of experience in higher education. With administration experience in student life at the University of Wyoming and experience on the academic side of things at Berea College, Dr. Sandberg has a strong, institutional view. One of the things that Dr. Sandberg found appealing about Georgetown College was the love that alumni have for the college. Dr. Sandberg is optimistic about this place and this college and is excited to build on its strong foundation. that he spent months training for. His personal best was his second 5k, the Finley 5k where he ran a 25:20. Overall, his biggest motivation to stay active is his family, being in shape for them and enjoying the health benefits. rapher or writer for the features section, contact Sophie Hughes at shughes@georgetowncollege. and granddaughter was predictably mended by the end of the film when they inevitably work together to defeat Myers. The relationship arc between Laurie’s teenage granddaughter, Allyson, and her boyfriend, Cameron, seemed cliche, as well. A couple of characters did surprise me with their actions, such as Allyson’s quirky–best–friend–turned–creep, as well as Myer’s twisted therapist. However, these were not major characters, and were eliminated quickly after showing their true colors. My favorite moment in the film was the unintentional comedic moment when a police officer searching the neighborhood for Myers sees a masked figure on the sidewalk and immediately mows him down with his car. He does this on Halloween, when there are hundreds of people in costumes. While I have my issues with the new “Halloween,” I didn’t dislike every aspect. Some of the scenes were captivating, such as in the mental facility’s courtyard when Myers is shown his own iconic mask, and the other inmates are freaking out. Being reintroduced to our psychotic villain in this wide–open space in the middle of the day was an interesting, chilling scene, and a brilliant choice on Green’s part. The action scenes were also effective. The end of the film takes place in Laurie’s home/fortress, as Myers plays cat–and–mouse with her family in the dark. I admit, some of those moments had me on the edge of my seat. While “Halloween” is not a bad movie, I still think it failed to meet the hype. However, if you’re just looking for a fun slasher to see this Halloween, it might be up your alley. the bracelet of his daughter who died years before. The simplicity of this climax thoroughly sums up the production value of the movie. From the beginning of production, the movie had a lot going for it with the pairing of Damien Chazelle as director and Justin Hurwitz as film score composer; the duo recently won Oscars for their collaboration on the 2016 film “La La Land.” The film score in “First Man” is captivating and truly enhances the true story being told on the screen. If my praise for the director, leading actor, music and story telling isn’t enough to persuade you to see this movie, then maybe a numerical rating will. “First Man” is a 10/10, and everyone should enjoy the pleasure of experiencing such an important story in this movie-watching experience. Venom: the fierce and fun tale of an anti-hero By JEREMY MIZE Staff Writer “Venom,” directed by Ruben Fleischer, and the screenplay by Jeff Pinker, Scott Rosenberg and Kelly Marcel, tells the story of Eddie Brock, a former journalist who comes in contact with an alien symbiote named Venom. Played by the talented Tom Hardy, Eddie Brock is a man who lost his career and his fiancée due to an attempt at discrediting a dubious CEO named Carlton Drake (played by Riz Ahmed). Because of rumors, Brock discovers several deaths as a result of Drake’s company, Life Foundation, and their secret research and exploits. Venom is an alien symbiote brought to Earth by Life Foundation as a means to “help” the human race evolve and adapt. ters. (Though, spoiler, the whole eating the organs from the insides during the bonding and killing human hosts after symbiotes leave them willingly is, while an interesting notion to the story, a bit overboard to the character’s origin itself). As this film has nothing to do with the iconic Spider-Man, the story and characters are presented in a manner that’s apt for Venom. It gives the character his own story without having to rely on another’s to give it meaning. This molds in the moral ideals that define Eddie, which Venom comes to respect and honor. It shifts the symbiote from villain to hero and aids Eddie into stopping the villains’ plans for seeking power. “Venom” is a film revealing the sense of a change of heart and how redemption can lead one to do the right thing, even if it gets a bit gruesome at times. parent at one time when we were younger. Whether you admired your mom or dad, the message in the song applies to both. Country is probably the most diverse genre of music there is. If there is a certain type of music that you like, there is a high probability that there is a Country version of it that you would like. Remember when Taylor Swift was a Country singer? She recently worked with another Country group, Sugarland, to write the song “Babe.” Not to mention everyone has probably heard “The Devil Went Down to Georgia” by The Charlie Daniels Band, “Friends in Low Places” by Garth Brooks, “Chicken Fried” by Zac Brown Band, and practically anything by Johnny Cash like “Ring of Fire,” “Hurt,” and “Folsom Prison Blues” to name a few. I encourage anyone who reads this article to listen to any of the songs that seem to interest you and listen to the messages and stories they tell and end the cycle of repeating songs that we all seem to be in. our independence. We forced them to live on reservations, and brought all kinds of diseases from Europe which they had no immunity to. Elizabeth Warren does not struggle with these problems. She makes a huge salary working for the Senate, had a cushy job as a law professor at Harvard and lives in a mansion. She is one of the most privileged people in the country, as most politicians are. It is extremely disrespectful of her to claim to be Native American when she was not raised in the culture and barely has any DNA that would belong to a tribe. Elizabeth Warren, or as President Trump has nicknamed her “Pocahontas,” needs to stop painting with all the colors of the wind and paint with the one she truly is: white. rest, the fathers can step in to watch and spend quality time with the newborn. This also saves money on the unpaid leave from having to hire a nanny or daycare. Studies also show that paternity leave can be great for the marriage, not feeling like one parent is pulling in more weight than the other, bringing up arguments of “you don’t help raise our child,” and “I’m the only one bringing in money right now.” Saying this, more men should be requesting to go on paternity leave from their employers! of the Georgetown Times. However, he also during this time served in the state House of Representatives representing Georgetown. Aldridge’s card also notes that he was “one of the finest short editorial writers in the state.” S. D. Cockran graduated from Georgetown in 1887. On Feb. 7, 1889 he married Dora Denton. The two of them had four children. Cockran’s primary occupation was farming. He represented Garrard Co. in the State Legislature for two terms in 1904 and 1906. Cockran died May 5, 1918. Robert Emlin Roberts is the next alumnus. The card does not give very much information about him but we know he graduated from Georgetown in 1876. He continued to reside in Georgetown his entire life. He was a lawyer and a member of the Legislature. Roberts died in 1910. Lyman J. Parrigin graduated from Georgetown in 1905. He married Bess E. Goggin, an education student at the University of Kentucky. They had three children. He started his career as a traveling salesman for a grocery company and then a tie company. He then became a farmer in Mill Springs, Kent. for two years. In 1914, he won a term in the State Legislature. After that, he worked for the Internal Revenue Service and then was an Oil Well contractor and oil producer. Parrigin was also involved in the Freemasons, the Shriners and was a charter member of the Paintsville Kiwanis Club. Parrigin died Dec. of 1932. Paul Heflin was born March 2, 1878 and graduated in 1897. Heflin’s card is the only one I have seen that specifically points out that he was “baptist.” He was from Flemingsburg, Kent.. On Oct.
Georgetown in 1862. On June 2, 1868 he married Anna Heard. Black received his law degree from Mercer University in Georgia. He worked as an attorney in Georgia. Black was a trustee of Mercer University and the Southern Baptist Theological Seminary. He was a member if the Electorial College representing Georgia. He was also a member of Augusta, Ga.’s city council and represented Georgia in the House of Representatives from 1893-1897. Black died in June of 1920. I think it is important to keep in mind that all of these people have “normal” jobs. They are bank cashiers, teachers and farmers. While there are still “normal” people like this in the U.S. congress, and even more at the state level, I think more people like these Georgetown graduates can only help the political landscape. If more regular people decided to run for congress, I believe that it would help eliminate the current political gridlock. These individuals truly knew what it was like in their home districts. I believe that this motivated them to keep up the good fight and truly fight for what they believe in and not just party. If we elect more politicians like this, we can truly do good in the world. Of course, I can not bring up politics without urging you to vote. I know it feels like everywhere you look people are urging you to vote, but there is a reason for this. America’s voter turnout is frankly embarrassing in my opinion, especially among young voters. So, I encourage you to go out and vote, regardless of your party, to make this country the best it can be.